Every Halloween, it seems we're on the verge of finding out. Example: I know of at least a half-dozen screenings with live music in New England in the next week. And though I try to limit myself to keep 'Phantom' from becoming too familiar, even I have three 'Phantoms' on the schedule this month. Well, despite concerns about over-exposure, the silent 'Phantom' starring Lon Chaney shows no signs of fading. Maybe the Andrew Lloyd Weber musical fuels continued interest. Maybe it's author Gaston Leroux's story, powerful in any form. Both certainly play a part, I'm sure. But I believe a lot of credit should go to the film itself. It's really, really good. And those of us who've seen it many times tend to lose sight of that, I think. So theater programmers will continue to run 'Phantom' for the same reason music directors continue to lead Beethoven's Fifth Symphony: it's one of the classics. Lon Chaney menaces Mary Philbin. And we shouldn't lose sight of the value of experiencing it as intended—in a theater with an audience, and with live music. Nor should we forget what a roller coaster ride 'Phantom' is for someone who's never seen it. If we stop showing it, we'll stop giving newcomers the chance for that "first-time" experience. 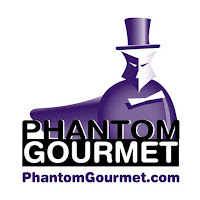 Having said all that, I found myself open to the idea of trying something different for this weekend's screening of 'Phantom' at the Aeronaut Brewery in Somerville, Mass. But they also asked me if it was possible to do some kind of audience participation during the film—something in the manner of Rocky Horror, perhaps. I thought about it, and felt the best way to go was to deputize the audience to help create elements of the accompaniment. Consider: one of the highlights of the 1924 silent film version of 'Peter Pan' is when the audience is asked to clap to save Tinkerbell. People inevitably rise to the occasion, and it's always great fun. Why not apply that same dynamic to 'Phantom of the Opera?' So that's what we'll try tomorrow night in what we're calling the first-ever "Collaborative Phantom." For the APPLAUD part: the silent 'Phantom' has several scenes in the Paris Opera where the audience is seen applauding something on stage. For the SCREAM part: two moments occur where our audience will be asked to basically scream bloody murder. The first time comes fairly early in the film, when the Opera House chandelier falls. The second is the Phantom' unmasking. If nothing else, I hope the chance to scream creates a sense of what experiencing 'Phantom' must have been like for its original audiences. Nowadays we've watched movies our entire lives, and we've seen everything. But early movie-goers were genuinely shocked by Lon Chaney's ghoulish appearance. But I think staging a "Collaborative Phantom" in which the audience actively contributes to the soundtrack instead of just passively watching the film, is a worthy project. I also think there's a good chance this might loosen up the audience we get so that everyone feels free to really react in any way they feel like. One of the great glories of silent film (and one of its unsung achievements, I think) is the audience experience it can produce. I hope you'll join us tomorrow night at the Aeronaut, and that you'll be a part of that experience! Details in the press release below. And if you can't make it this weekend, I'm doing it one mo' time this season—on Sunday, Oct. 30 at 4:30 p.m. at the Wilton Town Hall Theatre. More info on that to come next week. 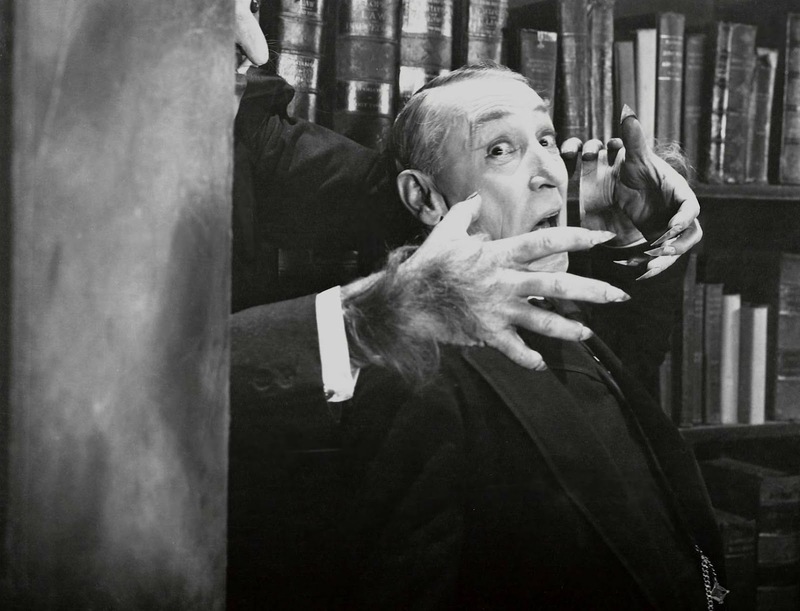 SOMERVILLE, Mass.—Get into the Halloween spirit with a spooky silent horror film! 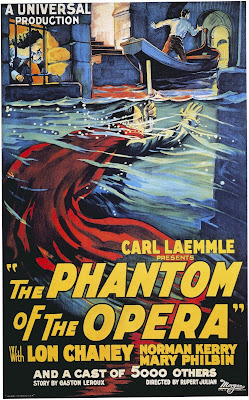 'The Phantom of the Opera' (1925), the first screen adaptation of the classic thriller, will be shown with live music on Sunday, Oct. 23 at 7 p.m. at the Aeronaut Brewing Co., 14 Tyler St. (near Union Square), Somerville, Mass. Live music will be performed by silent film accompanist Jeff Rapsis. Admission is $10 per person. Tickets are available online at www.eventbrite.com; search on "Aeronaut Brewery." The program is open to the public and is part of the Aeronaut's commitment to showcase local music, art, and performance. "The original 'Phantom' is a film that seems to get creepier as more time passes," said Rapsis, who is based in New Hampshire and frequently accompanies films in the Boston area. "It's a great way to celebrate Halloween, and also the power of silent film to transport audiences to strange and unusual places." 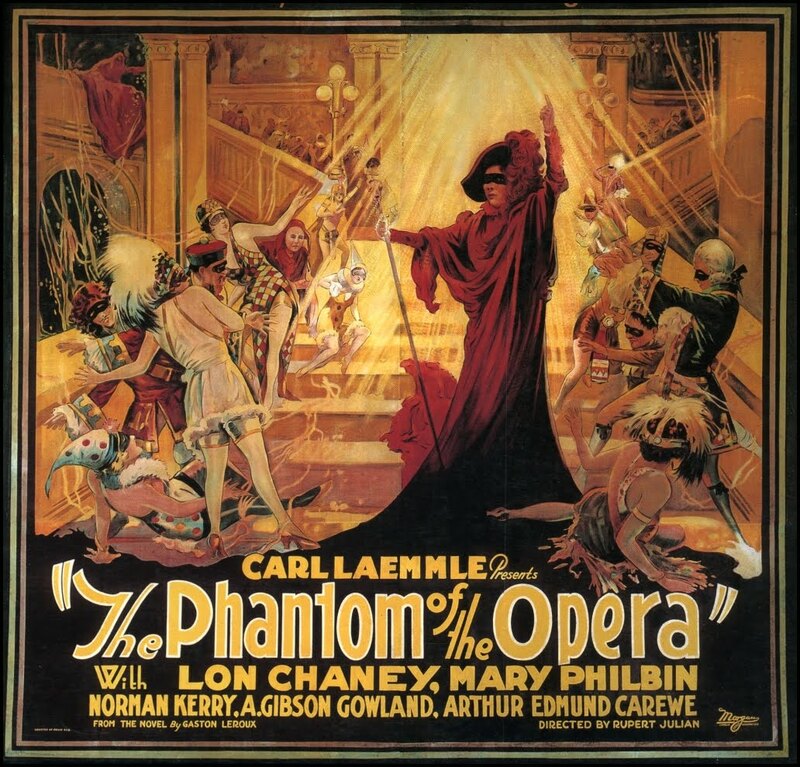 Original 'Phantom of the Opera' promotional art. ‘The Phantom of the Opera’ (1925) will be shown on Sunday, Oct. 23 at 7 p.m. at the Aeronaut Brewing Co., 14 Tyler St. (near Union Square), Somerville, Mass. Admission is $10 per person and seating is limited; for tickets and information, visit www.aeronautbrewing.com or www.eventbrite.com and seach on "Aeronaut Brewery." From today: Good color coming in this year across the road from our house. Spooky silent film shows in three states this weekend. I'll be haunting old movie theaters and even older town halls with creepy cinema and live (but deadly) music. 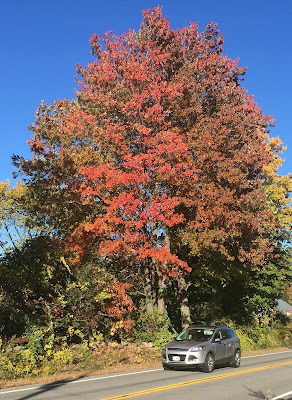 And it's peak foliage right now in northern New England: a little late due to lack of rain this summer, but coming in nicely nonetheless. I had to drive through rural Brookline and Hollis, N.H. on Thursday, and even on a cloudy day the colors are amazing. So it's a great weekend to go bombing around the New England countryside on a mini-tour that takes me to an evening show in Brandon, Vt. on Saturday; a Sunday afternoon show in Charlestown, N.H., and then an evening performance down in Boston at the Somerville Theatre. Because of the distance involved, I get to stay overnight in Rutland, Vt. I tell ya, this showbiz thing is just endless glam. In Brandon, it's 'Chiller Theatre,' so dubbed because when we started showing films as late as October, the Town Hall did not have central heating. It now does, but they've kept the name. The film is 'The Man Who Laughs' (1928), the amazing Paul Leni film starring Conrad Veidt in the title role. It's our final screening of the season in Brandon, where turnout has been strong all year. We've had some good publicity in local press, so here's hoping for a really big crowd for our last hurrah. More details of the screening are in the press release posted below. 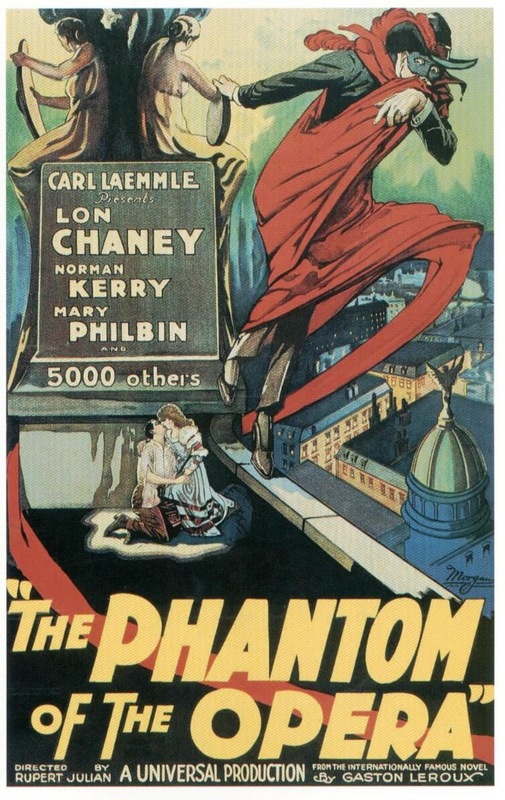 Sunday afternoon takes me to Charlestown, N.H., where the local historical society is screening a Lon Chaney double feature: 'The Unknown' (1927) followed by 'The Phantom of the Opera' (1925). Showtime is 2 p.m. at the "Old Town Hall," a building whose many functions over the years have included a stint as the town movie theatre. I always enjoy visiting Charlestown, as I covered the town for a time as a reporter for the Eagle-Times daily newspaper, based up the Connecticut River in Claremont, N.H.
To me, it was a sort of Granite State version of Lake Wobegon. The local grocery store was (and still is) actually named Ralph's, just as in Garrison Keillor's fictional town. And the place was (and yes, still is) filled with memorable characters. North Charlestown in home to the St. Pierre clan, an enormous family that runs a huge sand and gravel business. I got to know some of the brothers well enough to be invited to the annual family picnic, where one of the traditions was for everyone to gather on a flatbed and then have it hauled onto the truck scale to get the collective family weight! When I'm done in Charlestown, then I bomb down to the big city, Boston, where I'm accompanying Chaney again in 'The Unknown,' but this time it's a 35mm print. The 8 p.m. screening is the finale of the theater's annual multi-day "Terrorthon" festival. It's always a highlight to accompany films at this grand old theater, which has been showing movies since 1914 and where they still take the trouble to show vintage film on actual film. More details about the Sunday screenings can be found by clicking the "Upcoming Silent Film Screenings" link at the top right of this page. A lull follows Sunday, but things pick up again next weekend and then I have screenings virtually every day through Halloween. Be prepared to get scared! And of course, if the usual run-up to Halloween isn't scary enough, just turn on the news! Boo! Conrad Veidt and Olga Baclanova in 'The Man Who Laughs' (1928). BRANDON, Vt.—'The Man Who Laughs' (1928), a silent drama featuring a disfigured man forced to wear an insane grin all his life, will be screened with live music on Saturday, Oct. 15 at 7 p.m. at Brandon Town Hall. The film will be accompanied live by silent film musician Jeff Rapsis. The screening is free and open to the public. Donations are accepted to help support the town hall's ongoing renovation and restoration. 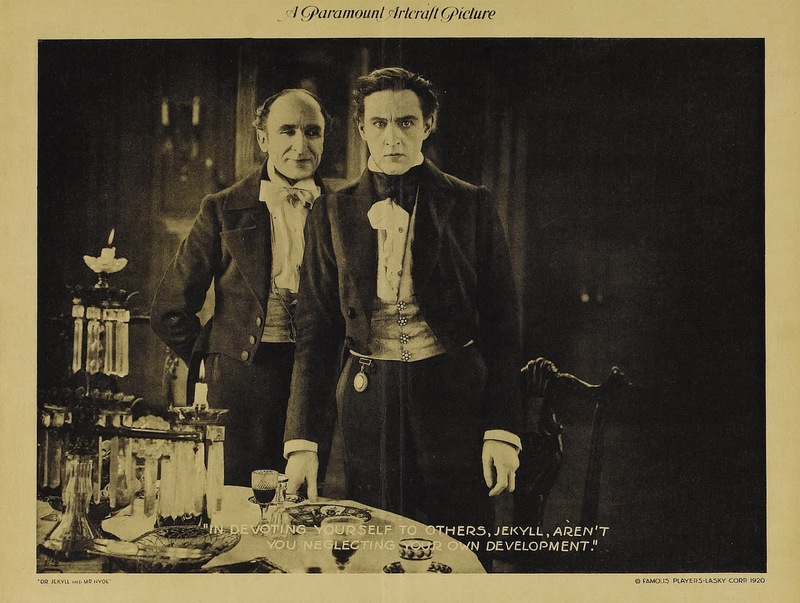 The screening is sponsored by Omya, Inc.
'The Man Who Laughs,' directed by Paul Leni and starring Conrad Veidt, was a popular silent film adaptation of a sprawling Victor Hugo novel set in 17th century England. 'The Man Who Laughs' will be be screened with live music on Saturday, Oct. 15 at 7 p.m. at Brandon Town Hall and Community Center, Route 7, in Brandon, Vt. Admission is free; free will donations are encouraged, with proceeds to support ongoing renovation of the town hall. For more information, visit www.brandontownhall.org. For more about the music, visit www.jeffrapsis.com. tonight at Red River Theatres in Concord, N.H.
Nailed! Character actor Tully Marshall in 'The Cat and the Canary' (1927). Last night, after a well-received screening of the Fritz Lang epic 'Woman in the Moon,' I was leaving the Flying Monkey Moviehouse when one of the staff guys there, Jessie, called me back. 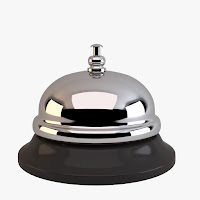 And isn't it odd that tonight, I DO need that dingy bell? 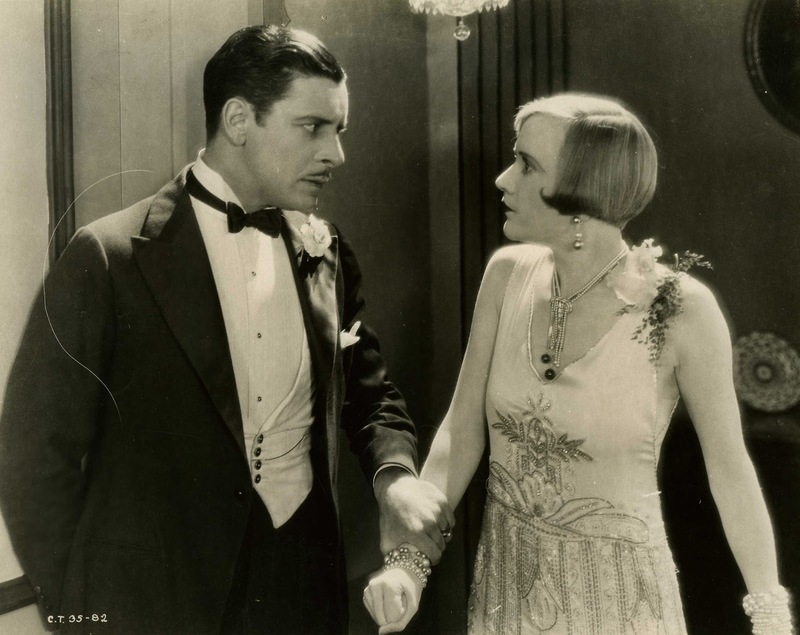 Specifically: I'm doing music for 'The Cat and the Canary' (1927) at Red River Theatres in Concord, N.H. Early in the film, we're treated to images of the insides of a clock as it chimes the midnight hour. And I know what would have happened later today. Getting my stuff ready for the show, I would have gone crazy looking for my dingy bell, not knowing that I had left it in Plymouth, N.H. a month before. Instead, I was reunited with my dingy bell just last night, and just in time for tonight's screening. 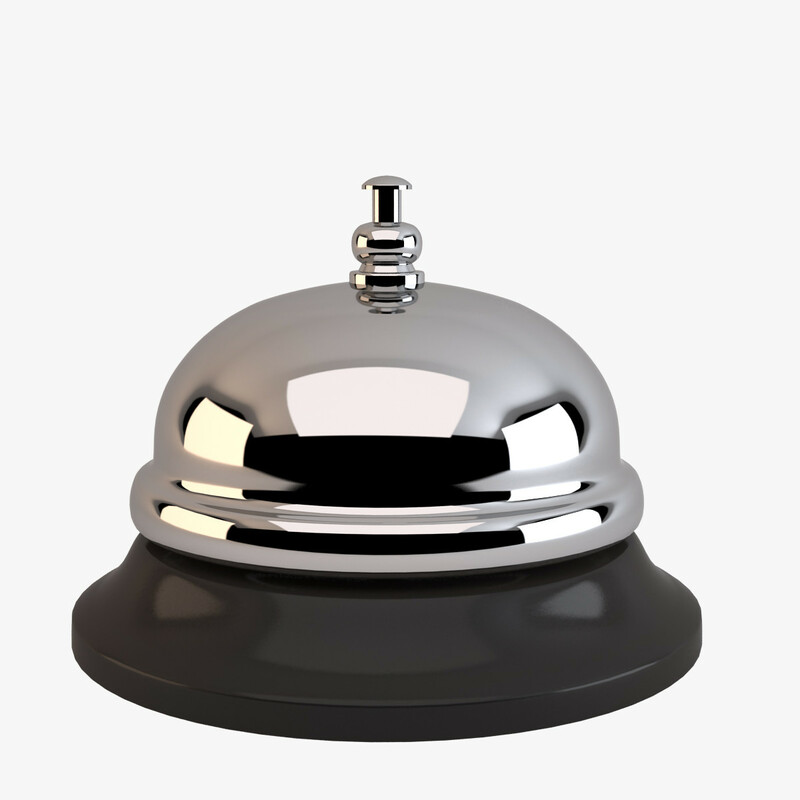 And yes, I know a dingy bell's official name is a "bellhop bell." 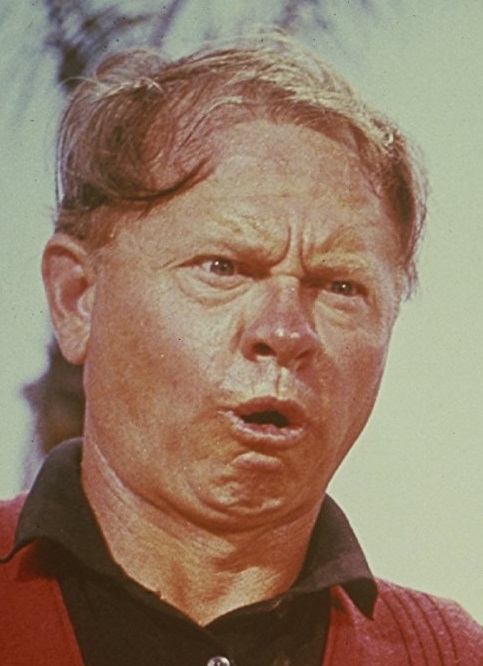 But I prefer "dingy bell" if for no other reason it's the name of Mickey Rooney's character in 'It's a Mad, Mad, Mad, Mad World.' (1963). Hope you can join us for a pre-Halloween showing of one of the most visually interesting silent films in the catalog—a visual feast of strange camera angles, strange settings, and strange faces filling up the screen. And it's all pretty spooky, too. More info in the press release below. Hope to see you there! And this weekend brings a mini-roadtrip to venues in Vermont, New Hampshire, and Boston. 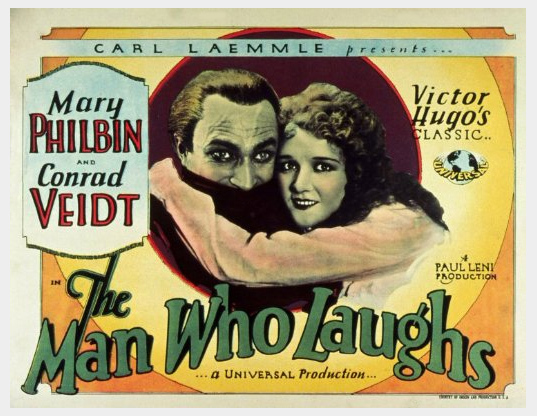 On Saturday night, I'm accompanying 'The Man Who Laughs' (1928) as our season-ending "Chiller Theatre" program at Brandon Town Hall in Brandon, Vt.
And Sunday brings a double-header. It starts with an afternoon program of Lon Chaney pics 'The Unknown' (1927) and 'Phantom of the Opera' (1925) in Charlestown, N.H.—a town where I once worked as a reporter! This will be followed by a mad dash to the Somerville Theatre (just outside Boston, Mass.) to do music for 'The Unknown' again. Although in the case of the Somerville, 'The Unknown' will be in the form of a 35mm print as part of the theater's annual "Terrorthon" festival. Showtimes and other details for each screening are listed in the "Upcoming Silent Film Screenings" link you'd find at the top right. I'll be updating from the road, too. But for now, here's the complete press release for this evening's screening of director Paul Leni's great thriller, 'The Cat and the Canary' (1927). Enjoy! 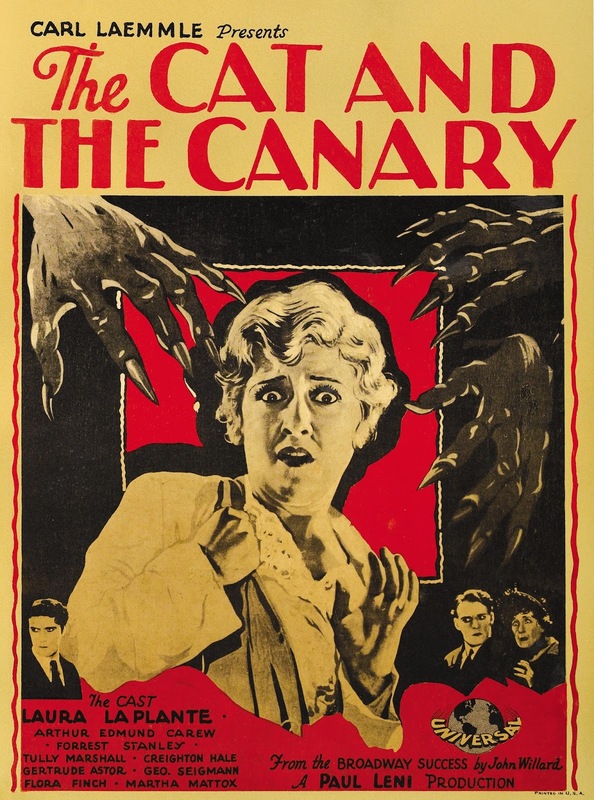 CONCORD, N.H.—'The Cat and the Canary' (1927), a haunted house thriller from Hollywood’s silent film era, will be screened with live music on Friday, Oct. 14 at 7 p.m. at Red River Theatres, 11 South Main St., Concord, N.H. The Red River screening will use a fully restored print that shows the film as audiences would have originally experienced it. 'The Cat and the Canary' will be accompanied by live music by New Hampshire composer Jeff Rapsis, who specializes in silent film scoring. 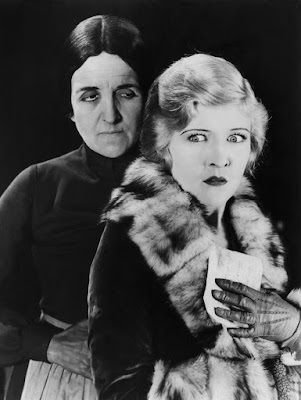 Martha Mattox and Laura Laplante in 'The Cat and the Canary' (1927). 'Cat and the Canary' will be shown on Friday, Oct. 14 at 7 p.m. at Red River Theatres, 11 South Main St., Concord, N.H. in the Jaclyn Simchik Screening Room. Admission is $10 per person; for more info, call (603) 224-4600 or visit www.redrivertheatres.org. For more about the music, visit www.jeffrapsis.com. Say cheese: the cast of 'Woman in the Moon' exploring the lunar surface in search of gold—and maybe something more valuable. Yes, movies aren't made without soundtracks anymore. And yes, about three-quarters of films from the silent era have completely disappeared. But still, I'm amazed at how the field continues to produce surprises, even today. Despite the limitations of being an obsolete medium missing a good part of its body of work, I keep discovering great stuff I've never heard of or knew about. Like almost everyone else, I was a long-time fan of 'Metropolis' (1927), director Fritz Lang's futuristic class warfare epic. It's one of the most well-known silent films, and rightly so. Imagine my surprise, then, to find out that Lang had afterwards produced an equally ambitious film, 'Woman in the Moon' (1929)—a movie that most people have never heard of. That included me, until about five years ago, when I finally got around to paying attention to it. 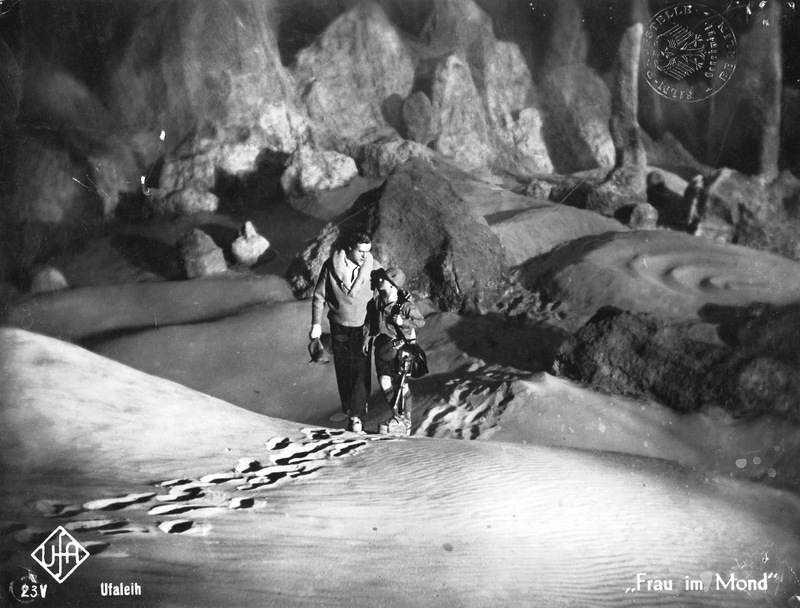 Even better—here was a story about adventures in outer space told through silent film at the peak of its expressive power and technical development. In short, it blew my mind! 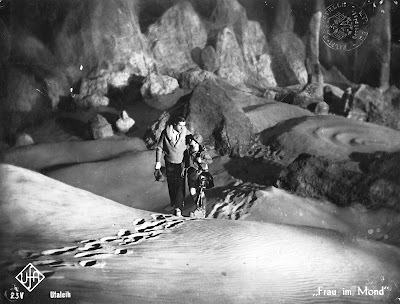 A 80-year-old space adventure that took silent film story-telling all the way to the surface of the moon—wow! I was also excited because my style of scoring, I think, is a good fit for Lang's way of directing a picture in the silent era. We're both suckers for the big gesture. So I developed some material for 'Woman in the Moon,' and now it's now one of my favorite films to present and accompany. One of the highlights of this adventure so far, I think, was doing music for 'Woman in the Moon' at the Harvard Film Archive a few years back. 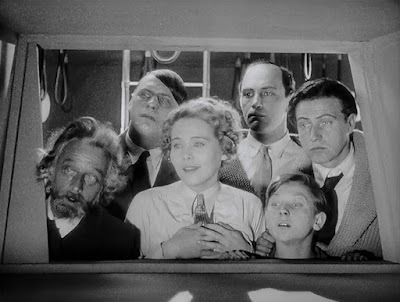 They screened a beautiful 35mm print as part of a Fritz Lang retrospective, and it really all came together that night. For me, 'Woman in the Moon' continues to stand as an important symbol of the vast unknown riches that silent film can offer. An original German poster for 'Woman in the Moon' (1929). at Flying Monkey in Plymouth, N.H.
PLYMOUTH, N.H.—A sci-fi adventure hailed as the first feature film to depict realistic space travel will be screened this month at the Flying Monkey. 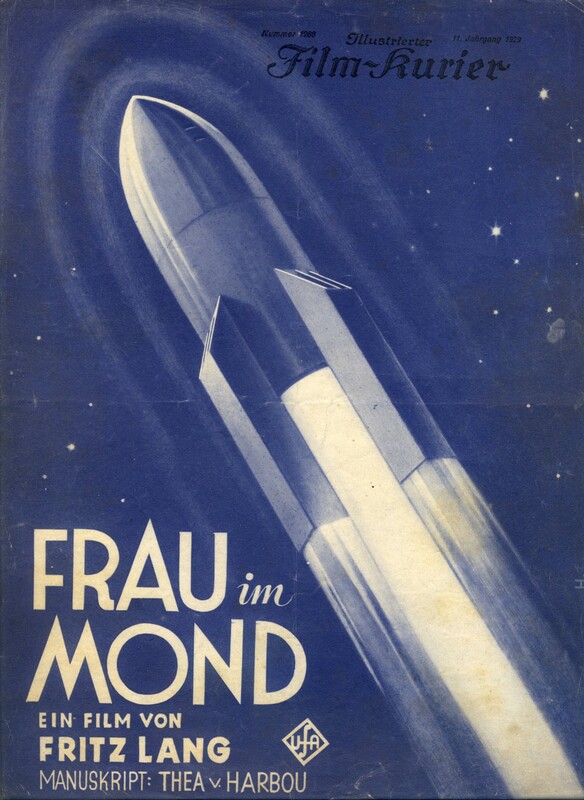 'Woman in the Moon' (1929), directed by German filmmaker Fritz Lang ('Metropolis,' 1927), will be screened with live music on Thursday, Oct. 13 at 6:30 p.m. at the Flying Monkey Moviehouse and Performance Center, 39 South Main St., Plymouth, N.H. The screening is open to the public. Admission is $10 per person. But 'Woman in the Moon,' with its melodramatic plot, also stands as the forerunner of many sci-fi soap opera elements that quickly became clichés: the brilliant but misunderstood professor; a love triangle involving a female scientist and her two male crewmates; a plucky young boy who yearns to join the expedition; fistfights and gunfire and treachery on the lunar surface. "This is a great and at-times bizarre film, one that must be seen to be believed," said Jeff Rapsis, a New Hampshire-based silent film accompanist who will create live music for the Flying Monkey's monthly silent film screenings. "It's as entertaining as any spy-thriller," Rapsis said. "And as a past vision of a future that didn't quite come to be, it really gets you thinking of time and how we perceive it." The space-faring cast of 'Woman in the Moon' prepares for the lunar landing. 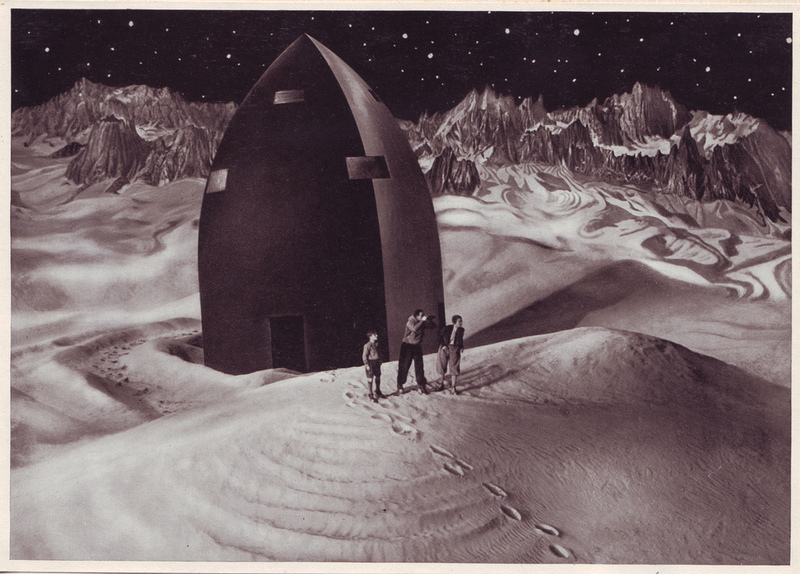 The moon, as imagined in a German silent film studio. ‘Woman in the Moon’ will be shown with live music on Thursday, Oct. 13 at 6:30 p.m. at the Flying Monkey Moviehouse and Performance Center, 39 South Main St., Plymouth, N.H. General admission $10 per person. For more info, visit www.flyingmonkeynh.com or call (603) 536-2551. Conrad Veidt and Olga Baklanova in 'The Man Who Laughs' (1928). Last night I attended a rehearsal of the N.H. Philharmonic, a local orchestra which later this season will play through a score I've composed. More on that as it develops. But for now, the prospect of a world premiere was scary enough to remind me that we're entering the busiest time of the year for silent film musicians: Halloween. Yes, the remainder of this month is crowded with silent film screenings all over New England, and all designed to put people in a mood macabre. And it's fitting. One of the lasting images of silent film is Lon Chaney as the Phantom of the Opera, playing subterranean pipe organ. It's not just me. Other area accompanists such as Peter Krasinski have heavy schedules of Halloween fare. So silent film fans, prepare for a scary smorgasbord of spooky silents ("Alliteration, the newsman's poetry!") in locations ranging from rural towns to the big city—in our case, Boston. Original promotional material for 'The Man Who Laughs' (1928). Also, two screenings mark the start of new silent film series in the Boston area that I'll be accompanying. At the Capitol Theatre in Arlington, Mass. 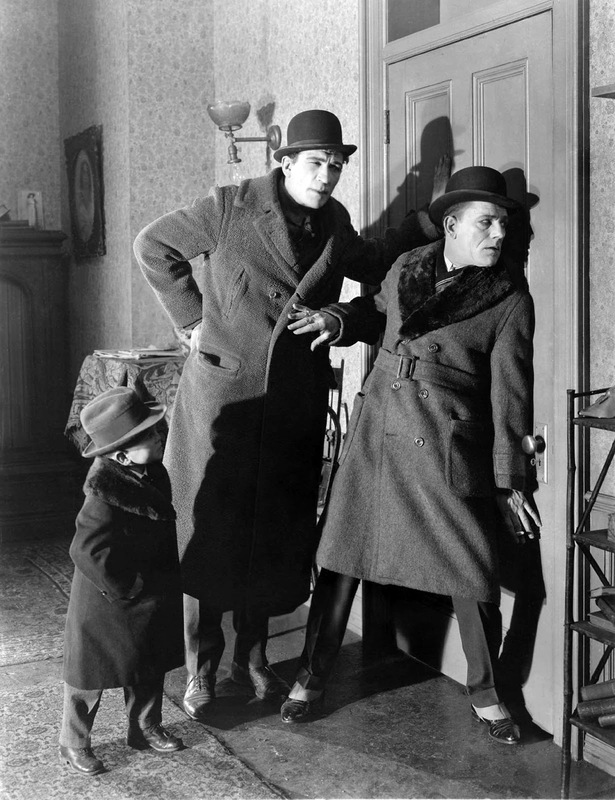 a screening of the rarely seen Chaney film 'The Unholy Three' (1925) will launch what's intended to be a monthly program of silent film screenings with live music. The Capitol is sister theater to the Somerville Theatre in nearby Somerville, Mass., where I also accompany a monthly silent film series. The difference is that the Somerville is committed to showing 35mm prints; the Capitol is where we'll run worthy titles for which 35mm prints simply isn't available. And at the Regent Theatre, also in Arlington, Mass., I'm pleased to report that last spring's screening of Mary Pickford's early feature 'Rags' (1916) was successful enough for this 100-year-old venue to add periodic silent film screenings to its regular schedule. First up is on Friday, Oct. 28, when we'll run 'Nosferatu' (1921), a great Halloween film and one which I think gets even creepier as the years go by. The Regent intends to include silent film with live music on a regular basis for this season, and I hope we'll be able to build a good audience there. Okay, here's the spooked-up calendar through the end of the month. • Tuesday, Oct. 11, 2016, 6 p.m.: "The Leopard Woman" (1920); Carpenter Memorial Auditorium, Manchester Public Library, 405 Pine St., Manchester, N.H.; (603) 624-6550; Manchester Public Library. Battle-of-wits jungle drama about an British explorer and a female spy from a rival goverment ordered to foil his mission. The fun begins when rather than killing the explorer, she falls in love with him—and then he goes blind! Monthly series of rarely screened silent films presented with live music in 1913 auditorium. Admission free, donations encouraged. • Thursday, Oct. 13, 2016, 6:30 p.m.: "Woman in the Moon" (1929); The Flying Monkey Movie House and Performance Center, 39 South Main St., Plymouth, N.H.; (603) 536-2551; http://www.flyingmonkeynh.com/. The final silent film of director Fritz Lang ('Metropolis') is an amazing epic about mankind's first-ever lunar voyage, complete with espionage, romance, stowaways, and spectacular visual design. Part of a monthly silent film series at a newly restored moviehouse in Plymouth, N.H. Admission, $10 per person. Actor Tully Marshall is about to meet his end in 'The Cat and the Canary' (1927). • Friday, Oct. 14, 2016, 7 p.m.: "The Cat and the Canary" (1927) directed by Paul Leni, starring Laura LaPlante; Red River Theatres, 11 South Main St., Concord, N.H.; (603) 224-4600; http://www.redrivertheatres.org/. Can a group of strangers survive the night in a haunted house to learn the secret of a madman's will? Find out in the original Gothic thriller from silent film director Paul Leni. Just in time for Halloween, a movie filled with deep shadows, dark secrets, and a surprisingly timeless mix of humor and horror that will keep you guessing. Remember: in silent film, no one can hear you scream! See if if you dare! Silent film with live music at this popular venue for independent and arthouse cinema in New Hampshire's state capital. Admission $10 per person. • Saturday, Oct. 15, 2016, 7 p.m.: "The Man Who Laughs" (1928) starring Conrad Veidt; Brandon Town Hall and Community Center, Main Street/Route 7, Brandon, Vt.; http://www.brandontownhall.org. Silent film adaptation of Victor Hugo's historical novel about a man cursed with a permanent carnival-freak-like grin on his face. The make-up job for actor Conrad Veidt inspired the look of Batman's arch-nemesis the Joker. 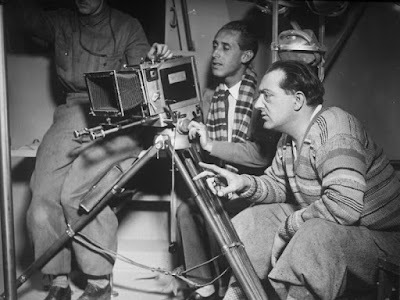 Directed by Paul Leni, who pioneered the visual style used in Universal horror classics such as 1931's 'Dracula' and 'Frankenstein.' See it if you dare! Preceded by spooky comedy short subjects. Join us for a series of silent films and live music in a wonderfully restored town hall in Brandon Vt. that features great acoustics. Admission free, donations accepted, with proceeds to help continuing preservation work. 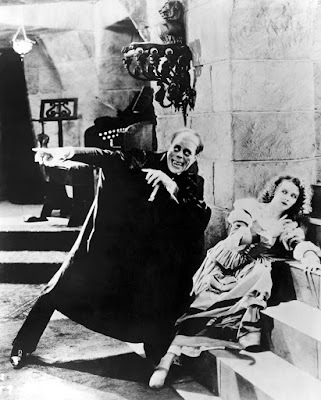 • Sunday, Oct. 16, 2016, 2 p.m.: "Lon Chaney Double Feature", Charlestown Old Town Hall, 19 Summer St., Charlestown, N.H. Just in time for Halloween: two movies starring Chaney, 'The Phantom of the Opera' (1925) and 'The Unknown' (1927), make up a creepy double feature presented by the Charlestown Historical Society. 'The Phantom of the Opera' (1925) ranks as one of the most revived films of the silent era. 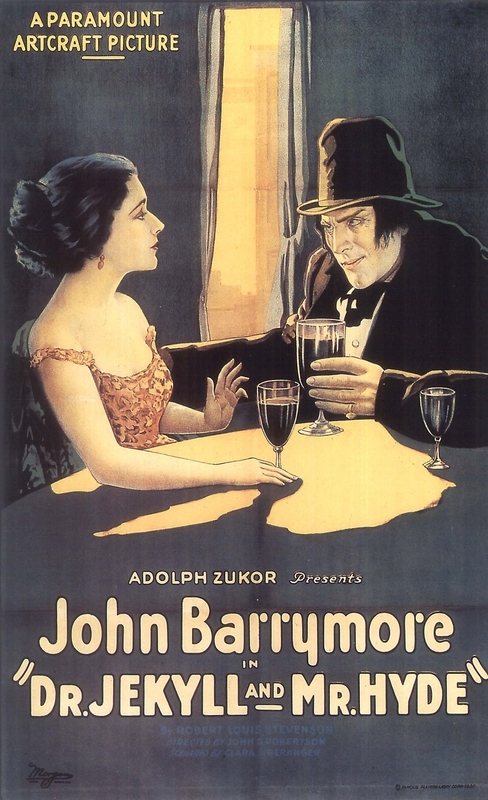 With Chaney in the lead role, the original movie adaptation of the story of a deformed musician living beneath the Paris Opera House remains an audience favorite. 'The Unknown' (1927) features Chaney as "Alonzo the Armless," a circus knife-thrower with a dark past who uses his feet to perform his act. The film co-stars a very young Joan Crawford. Admission is free and the public is welcome; donations are encouraged, with proceeds to support Historical Society activities. • Sunday, Oct. 16, 2016, 8 p.m.: "The Unknown" (1927) starring Lon Chaney; Somerville Theatre, 55 Davis Square, Somerville, Mass. 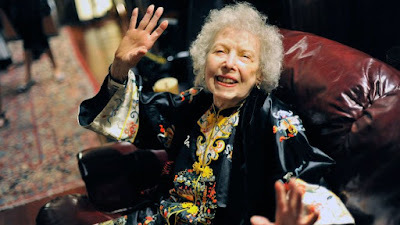 ; http://www.somervilletheatreonline.com. Celebrate Halloween with a twisted circus drama starring Lon Chaney as 'Alonzo the Armless' and a very young Joan Crawford as the woman he loves but cannot have. Directed by Tod Browning, who would go on to create the cult classic 'Freaks' (1932). Part of a planned multi-day "TerrorThon" at the Somerville Theatre, a 100-year-old moviehouse committed to keeping alive the experience of 35mm film on the big screen. Featuring outstandingly exacting work of legendary projectionist David Kornfeld. For more info, call the theater box office at (617) 625-5700. Admission is either single ticket or through multi-day pass. Check with theater for details. Original poster art for the original screen adaptation of 'Dr. Jekyll and Mr. Hyde.' (1921). •Sunday, Oct. 23, 2016, 1 p.m. "Dr. Jekyll and Mr. Hyde" (1921) starring John Barrymore; Whitingham Free Public Library, 2948 Route 100, Jacksonville, Vt.; (802) 368-7506. Just in time for Halloween! John Barrymore plays both title roles in the original silent film adaptation of the classic novella by Robert Louis Stevenson. A performance that helped establish Barrymore as one of the silent era's top stars. Free and open to the public. • Sunday, Oct. 23, 2016, 8 p.m. "Phantom of the Opera" (1925) starring Lon Chaney, Mary Philbin; Aeronaut Brewing Co., 14 Tyler St., Somerville, Mass. Admission $10 per person, limited seating. 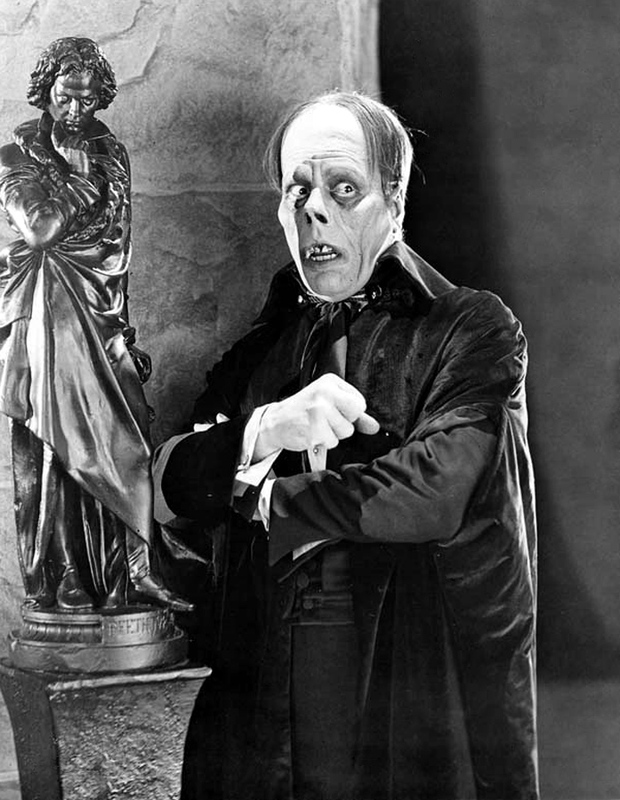 Long before Andrew Lloyd Webber created the hit stage musical, this silent film adaptation starring Lon Chaney helped place 'Phantom' firmly in the pantheon of both horror and romance. Just in time for Halloween! Part of the Aeronaut Brewery's commitment to showcase local music, art, and performance. Limited seating so reserve early; for more details on tickets, visit Aeronaut Brewing online. • Tuesday, Oct. 25, 2016, 6:30 p.m.: "The Man Who Laughs" (1928) starring Conrad Veidt; The Flying Monkey Movie House and Performance Center, 39 South Main St., Plymouth, N.H.; (603) 536-2551; http://www.flyingmonkeynh.com/. Silent film adaptation of Victor Hugo's historical novel about a man cursed with a permanent carnival-freak-like grin on his face. The make-up job for actor Conrad Veidt inspired the look of Batman's arch-nemesis the Joker. Directed by Paul Leni, who pioneered the visual style used in Universal horror classics such as 1931's 'Dracula' and 'Frankenstein.' See it if you dare! Preceded by spooky comedy short subjects. Part of a monthly silent film series at a newly restored moviehouse in Plymouth, N.H. Admission, $10 per person. • Wednesday, Oct. 26, 2016, 7 p.m.: "The Man Who Laughs" (1928) starring Conrad Veidt; Rogers Center for the Arts, Merrimack College, 315 North Turnpike St., North Andover, Mass. (978) 837-5355. Creepy and unnerving adaptation of Victor Hugo's historical novel about a man cursed with a permanent carnival-freak-like grin on his face. The make-up job for actor Conrad Veidt inspired the look of Batman's arch-nemesis the Joker. Great Halloween film, set the stage for Universal horror classics such as 'Frankenstein' and 'Dracula.' Silent film with live music on the campus of Merrimack College. Free admission. For more information, visit the Rogers Center online. • Thursday, Oct. 27, 2016, 8 p.m.: "The Unholy Three" (1925) starring Lon Chaney, directed by Tod Browning; The Capitol Theatre, 204 Massachusetts Ave., Arlington, Mass. ; (603) 536-2551; http://capitoltheatreusa.com/. In this hypnotic mix of creepiness and crime, the man of a thousand faces (Chaney) plays a ventriloquist who dons a granny disguise to team with a strongman and a little person in a bizarre robbery scheme that ends in murder. The film is the first collaboration between Chaney and director Browning, who would helm seven more Chaney movies before making sound era horror history with 'Dracula' (1931) and 'Freaks' (1932). A great way to get into the Halloween spirit. See it if you dare! • Friday, Oct. 28, 2016, 7:30 p.m. "Nosferatu" (1921); Regent Theatre, 7 Medford St., Arlington, Mass; (781) 646-4849, www.regenttheatre.com. Admission $12 in advance, $15 at door. Celebrate Halloween by experiencing the original silent film adaptation of Bram Stoker's famous 'Dracula' story. Still scary after all these years—in fact, some critics believe this version is not only the best ever done, but has actually become creepier with the passage of time. See for yourself, if you dare. Silent film with live music in a theater that's been operating for more than a century! • Saturday, Oct. 29, 2016, 8 p.m.: "The Man Who Laughs" (1928) starring Conrad Veidt; Leavitt Theatre, 259 Main St. Route 1, Ogunquit, Maine; (207) 646-3123; http://www.leavittheatre.com. Silent film adaptation of Victor Hugo's historical novel about a man cursed with a permanent carnival-freak-like grin on his face. The make-up job for actor Conrad Veidt inspired the look of Batman's arch-nemesis the Joker. Directed by Paul Leni, who pioneered the visual style used in Universal horror classics such as 1931's 'Dracula' and 'Frankenstein.' See it if you dare! Preceded by spooky comedy short subjects. See great silent films with live music in a summer-only theater opened in 1923 and barely changed since. Admission $10 per person. • Sunday, Oct. 30, 2016, 4:30 p.m.: "Phantom of the Opera" (1925) starring Lon Chaney, Mary Philbin; Wilton Town Hall Theatre, Main Street, Wilton, N.H.; (603) 654-3456; www.wiltontownhalltheatre.com. 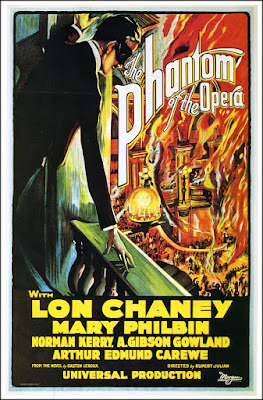 Long before Andrew Lloyd Webber created the hit stage musical, this silent film adaptation starring Lon Chaney helped place 'Phantom' firmly in the pantheon of both horror and romance. Just in time for Halloween! Part of a series of silent films with live music at a theater where movies have been shown since 1912! Admission free, donations of $5 per person encouraged. Somerville—but how much of this is Batman? An original poster for 'The Mark of Zorro' (1920). Today at 2 p.m., I'll be accompanying a screening of 'The Mark of Zorro' (1920) at the Somerville Theatre in Davis Square, Somerville, Mass. It's a terrific movie, highlighted by the visible on-screen joy of Douglas Fairbanks Sr. discovering the swashbuckling formula that would carry him through epic adventures for the rest of the silent era. And the film is actual film, in the form of a great 35mm print from the Museum of Modern Art. It's a rainy Sunday, so hope you can join us! For all the details, check out the press release I've pasted in below. But there's one aspect of 'Zorro' that I would like to know more about. Perhaps you can help. Do you know the back story of 'Batman'? I know it includes a Bruce Wayne as a very young boy vowing to become a crime-fighter after witnessing the murder of his parents outside a Gotham City movie theater. It made sense because that's how Wayne would have gotten the idea for the masked fighter of crime, and so many other Batman elements that are similar to Zorro. 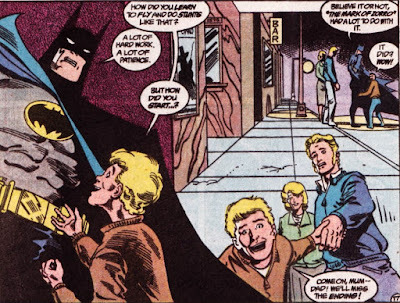 It also made sense in terms of the timing: Bruce Wayne was born in 1915, which would make him just old enough to be present at 'Zorro,' and also to fuse the trauma of the murder with what he saw in the movie. But I've just gone to look for more specifics about this, and couldn't find anything online. Well, except for this page from "Batman 459"
Maybe it's just because there's so much material out there about Batman, this part of the story has just been buried under the avalanche of pop culture. 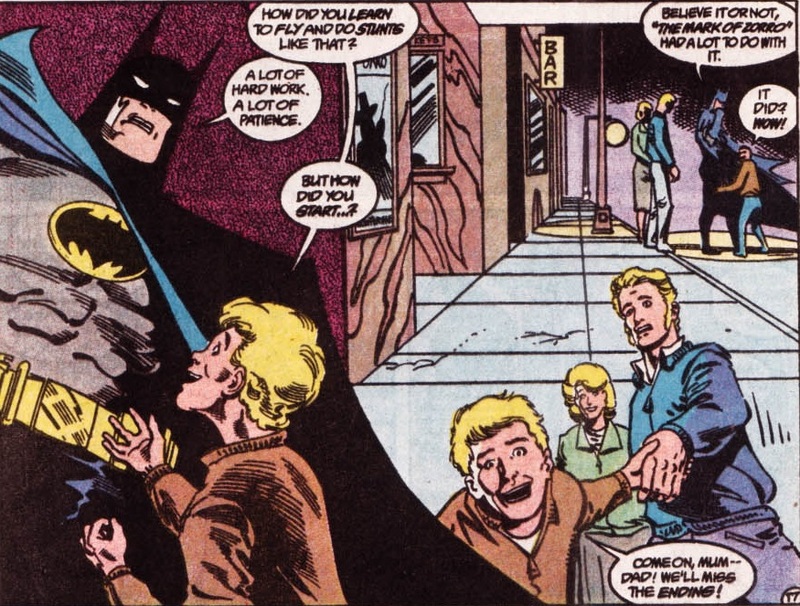 It seems that whatever the Batman backstory was, it was filled in much later. And if Bruce Wayne was inspired by Zorro, there's some confusion over whether the 'Zorro' connection is between the silent version or with the 1940 remake starring Tyrone Power. So if anyone knows anything about this backstory, such as when it appeared or even if it's true or not true, that would be great! For a long time now, I've pointed to the 'Zorro' and 'Batman' connection as a great example about how the DNA of early cinema is part of today's visually oriented culture. Well, if I'm going keep making the case in this way, it's about time I knew what I was talking about, right? So if any Batman experts are out there, let me know what the real story is. Send me a note at jeffrapsis@gmail.com. For now, I hope you'll be able to join us for Douglas Fairbanks Sr. in 'Zorro,' who I still think of as the original Batman. Here's the press release with all the details! Douglas Fairbanks stars in 'The Mark of Zorro' (1920). SOMERVILLE, Mass.—It was the original swashbuckling blockbuster—the film that first brought 'Zorro' to the big screen, and also turned actor Douglas Fairbanks into Hollywood's first-ever action hero. 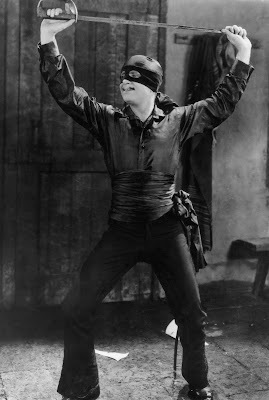 'The Mark of Zorro' (1920) will once again fill the silver screen, accompanied by live music on Sunday, Oct. 2 at 2 p.m. at the Somerville Theater, 55 Davis Square, Somerville. The film will be screened using a 35mm print. General admission to the program is $15 per person/$12 student and seniors. The screening, the latest in the Somerville's "Silents, Please!" series, will feature live accompaniment by Jeff Rapsis, a New Hampshire-based composer who specializes in creating scores for silent films. Admission is free and open to the public. 'The Mark of Zorro,' a major hit when first released, tells the story of young Don Diego Vega, the son of a wealthy ranch owner in Spanish California of the early 19th century. Witnessing the mistreatment of the poor by rich landowners and the oppressive colonial government, Don Diego assumes the identity of "Señor Zorro," a masked figure of great cunning and skill, and vows to bring justice to the region. The film stars Douglas Fairbanks Sr., who until 'Zorro' had focused on playing traditional all-American leading roles in romantic comedies. 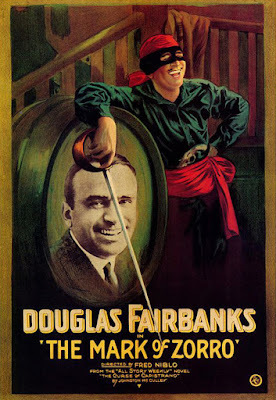 The success of 'Zorro' launched Fairbanks on a series of historical adventure films that went on to rank among the most popular spectacles of the silent era, including 'The Three Musketeers' (1921) and 'Robin Hood' (1922). The original 'Zorro' film was so popular it inspired one of Hollywood's first big-budget sequels, 'Don Q, Son of Zorro' (1925), also starring Fairbanks. 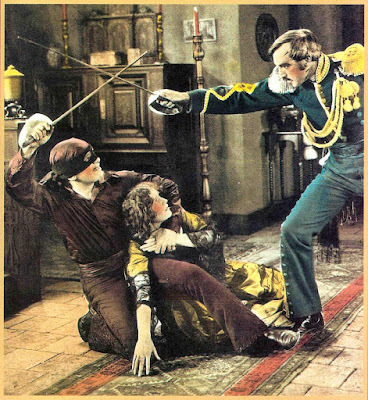 Critics have praised 'The Mark of Zorro' for its tight story, fast pace, and exciting action sequences, which include many stunts performed by Fairbanks himself. Steven D. Greydanus of the Decent Films Guide wrote that the silent Zorro "...contains some of the most jaw-dropping stunts I’ve ever seen this side of Jackie Chan." 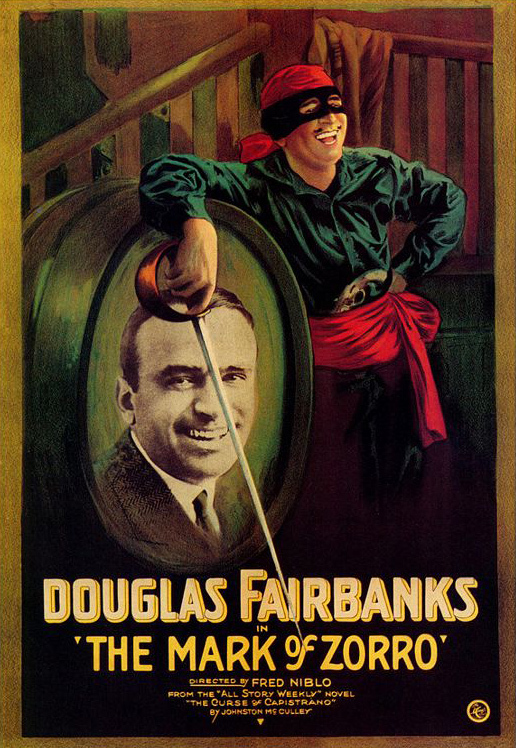 Film writer Leonard Maltin described 'Zorro' as a "silent classic with Fairbanks as the masked hero...perhaps Doug's best film...nonstop fun!" This genre-defining swashbuckler was the first movie version of the Zorro legend. The story has since been remade and adapted many times, most recently in 1998 as 'The Mask of Zorro' starring Anthony Hopkins and Antonio Banderas. 'The Mark of Zorro' was the first film released by the newly formed United Artists studio, formed in 1920 by Fairbanks with fellow silent film superstars Mary Pickford, Charlie Chaplin, and director D.W. Griffith. The screening will be accompanied by improvisation-based musical score created live by New Hampshire silent film accompanist Jeff Rapsis. Rapsis achieves a traditional "movie score" sound for silent film screenings by using a digital synthesizer to reproduce the texture of the full orchestra. 'The Mark of Zorro' will be screened in 35mm with live music on Sunday, Oct 2 at 2 p.m. at the Somerville Theater, 55 Davis Square, Somerville, Mass. Admission is $15 adults, $12 students/seniors; general admission seating. For more information, call (617) 625-5700 or visit www.somervilletheatre.com. For more info on the music, visit www.jeffrapsis.com.